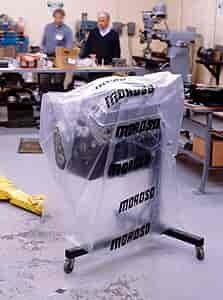 Keep your spare engine(s) clean and free from dust and grime with a Moroso engine bag. Each bag is constructed from tough, 4 mil clear poly and is big enough to fit over most engines with headers installed. Sold individually. Moroso also offers engine storage plates that are made from 1/8" thick steel with a durable zinc coating. Engine plates include mounting hardware and are designed to seal off the lifter valley area from foreign objects. 99400 is rated 5.0 out of 5 by 2.